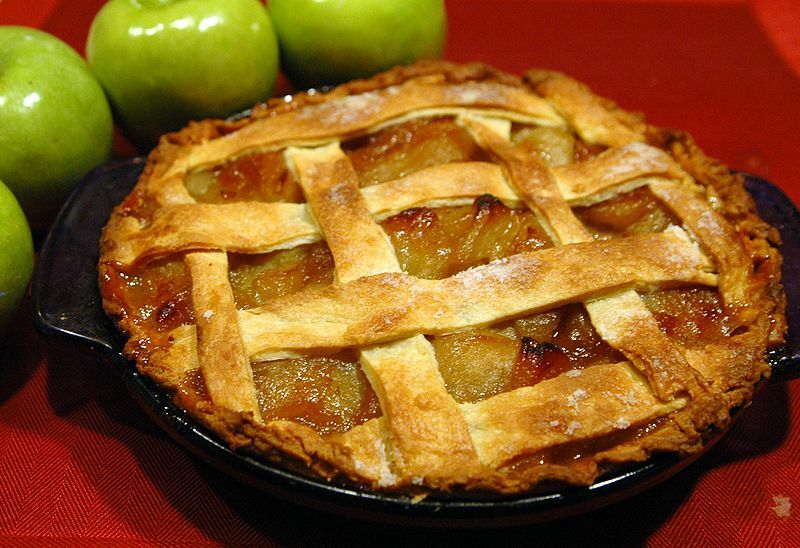 An apple pie is a fruit pie (or tart) in which the principal filling ingredient is apples. It is sometimes served with whipped cream on top. Pastry is generally used top-and-bottom, making a double-crust pie, the upper crust of which may be a disk shaped crust or a pastry lattice woven of strips; exceptions are deep-dish apple pie with a top crust only, and open-face Tarte Tatin. Left: Apple pie with lattice upper crust. Cooking apples, such as the Bramley or Granny Smith, are crisp and acidic. The fruit for the pie can be fresh, canned, or reconstituted from dried apples. This affects the final texture, and the length of cooking time required; whether it has an effect on the flavour of the pie is a matter of opinion. Dried or preserved apples were originally substituted only at times when fresh fruit was unavailable. English apple pie recipes go back to the time of Chaucer. In English speaking countries, apple pie is a dessert of enduring popularity, eaten hot or cold, on its own or with ice cream, double cream, or custard. In the English colonies the apple pie had to wait for carefully planted pips, brought in barrels across the Atlantic, to become fruit-bearing apple trees, to be selected for their cooking qualities, as apples do not come true from seeds. In the meantime, the colonists were more likely to make their pies, or "pasties", of meat rather than of fruit; and the main use for apples, once they were available, was in cider. But there are American apple-pie recipes, both manuscript and printed, from the eighteenth century, and it has since become a very popular dessert. 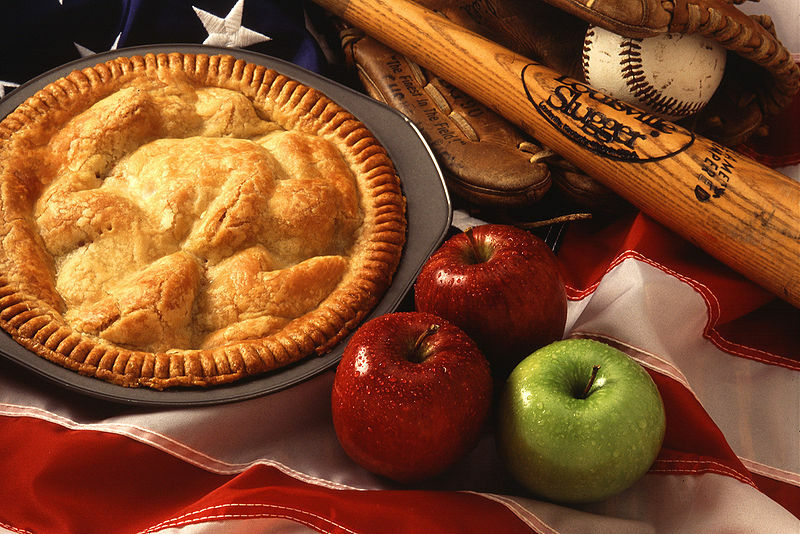 Although apple pies have been eaten since long before the discovery of America, "as American as apple pie" is a saying in the United States, meaning "typically American". Left: An apple pie is one of a number of United States cultural icons.